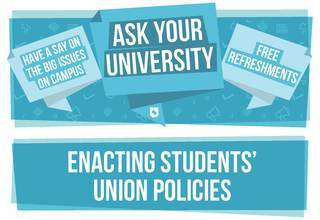 The “Ask Your University” events are set up by The University of Sheffield Students’ Union to give representatives and all students a chance to discuss current issues with leading University staff. The event prior to this one was about the broader topic of sustainability. On 7th December 2017, the workshop was around Students’ Union policies. Passed by Students’ Union Council, the Union has 48 live policies which set the direction of our organisation. Many of these policies relate to lobbying the University on particular issues and these were up for discussion at the event which took place in The Diamond. The event was attended by the Students’ Union Councillors but also a number of other students, who voiced their opinions in a healthy debate. The policies were split into four topics for discussion: Funding, fees and finance; accessibility and support; investments and research, and the living wage. One major problem that was brought up was the concern that the availability of scholarships may be imbalanced between the arts and the sciences. For example, there may be more scholarships for engineering than in other subjects and some scholarships are only specific to the country of origin. It was concluded that there are several university wide schemes that students can get involved with and that, depending on the competitiveness of a course and its demand, there will be different amounts of scholarships. Some students also seemed to be unaware of the recent scholarship event held in The Octagon, so there are plenty of opportunities that students may be missing out on. It was also discussed, how the university can help students from lower income backgrounds. The university’s work in engaging young people with university begins early in primary schools. Events are set up for children to visit the campus and make them feel like it belongs to their community. In terms of support, housing was another key issue that was brought up during the discussion. One of the main concerns with the policy was the welfare of mature students as it was raised that many of them felt socially isolated in flats that tend to be populated by much younger students. This was a particularly serious matter as statistics have shown that the dropout rate for mature students is twice as high compared to other groups. To solve this issue, university staff have considered allocating social spaces for these students so they can mingle and congregate. With a common room on campus for them to meet, mature students will not be as segregated and will have a support network. As the university also believes in making accessibility a priority, relevant modifications will be made to both older and newer buildings to cater to everyone, including disabled students. To aid sustainability, the university is looking into expanding the policy to stop selling bottled water in the Students’ Union completely, to potentially include University outlets. By installing water fountains around campus, students will have free and easy access to water whilst cutting down on the usage of plastic bottles. The Students’ Union also highlighted the importance of their policy around funding education over war, as they believe that the government should be putting more money into books instead of bombs. With that in mind, there has been a debate on whether the armed forces should still be allowed to recruit students at Octagon fairs. Important topics that were touched upon were wage differences and a potential gender pay gap. The cleaners are usually paid the least at the University, earning an average of £15,000 annually. The university is trying to get more women into leading positions and promote gender equality across the board. It was also debated whether the university should adopt a 10 to 1 pay ratio. Furthermore, there was a discussion about the Vice-Chancellors wage and whether it should be as high as it currently is. Due to the complexity of his job and his efforts to represent the university globally and form international relationships, it was claimed to be justified. At a lower wage offer the university would not be able to find a person with the necessary skills and reputation to properly carry out the demanding job of vice chancellor. With the opportunity for students to hold the university accountable on certain key issues, everyone had an active say on the policies around campus. Since the event was able to successfully facilitate discussion between the university and its students while clearing up major concerns, it proved to be a success.